The 24-year-old Bangor native set a new Irish record in the 100m Freestyle at the European Championships in Copenhagen. IRELAND’S JORDAN SLOAN continued his brilliant record-breaking charge in Copenhagen on Saturday afternoon, as the 24-year-old stormed to a new Irish standard in the 100m Freestyle at the European Championships. 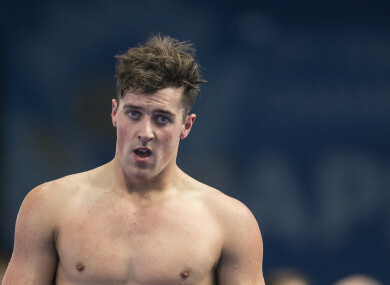 He became the first Irishman to break 48 seconds in the event in this morning’s heats, with the swimmer touching in 47.84 for second place in his heat. The previous record of 48.13 had been set by Sloan himself at the 2016 World Short Course Championships in Canada earlier last year. Saturday’s feat was not the first record the Bangor had broken in Denmark. Sloan has broken three Irish Records in the 100m Freestyle, 200m Freestyle and 400m Freestyle — with the 50m Backstroke to come tomorrow. Meanwhile following last night’s semi-finals, Mona McSharry will swim the 100m Breaststroke Final this afternoon at 4.16pm (Ireland). The 17-year-old, who is the current European and World Junior Champion in the event, is competing in her first senior international final. Also in record breaking form this morning, National Centre Dublin’s Conor Ferguson set a new Irish Junior Record in the 100m Individual Medley. Ferguson’s time of 55.41 bettered the record of 55.84 that he had set in Dublin last month. It was an impressive morning from other Irish swimmers in the pool with personal best times for Brendan Hyland in the 50m Butterfly (24.11), Calum Bain in the 100m Freestyle (48.29) and Danielle Hill in the 50m Backstroke (28.02) while Conor Brines was just off his Irish Record in the 50m Butterfly clocking 23.51. Email “Jordan Sloan breaks third Irish record at European swimming championships”. Feedback on “Jordan Sloan breaks third Irish record at European swimming championships”.